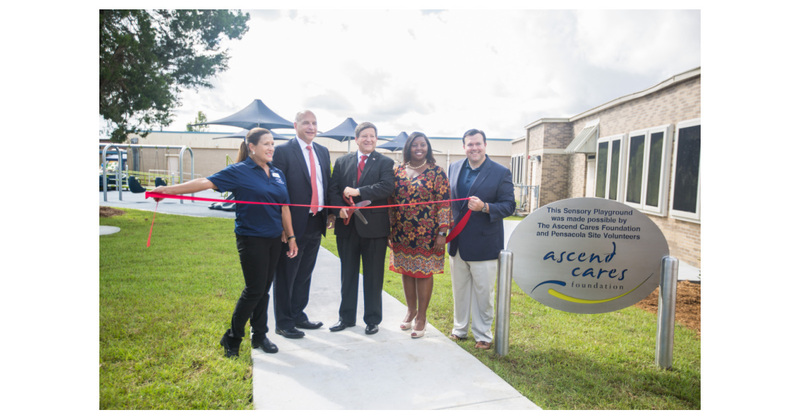 HOUSTON–(BUSINESS WIRE)–The Ascend Cares Foundation, a nonprofit organization funded and led by employees of Ascend Performance Materials, announced today the funding, installation and opening of a new sensory playground at Escambia Westgate School. Ascend Cares has partnered with Escambia Westgate School, located in Pensacola, Florida, for six years. The school is dedicated to teaching children with physical and intellectual disabilities from kindergarten to 12th grade. The previous playground at Escambia Westgate School was donated to another school in the community. The Ascend Cares Foundation is a 501(c)(3) organization founded in 2011 and is managed by team members of Ascend Performance Materials. It is financed through a combination of individual contributions and matching company funds. The foundation partners with other nonprofits serving the communities where Ascend Performance Materials employees live and work. Ascend Cares is focused on serving and supporting the areas of education, healthcare, children, families and the military through charitable giving and volunteering.